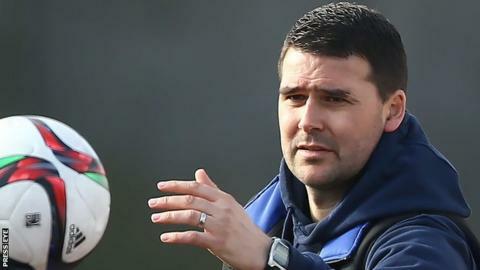 David Healy will be in the Linfield dugout for Saturday's crucial Irish Premiership game against Crusaders after having his four-game ban reduced. An Irish FA statement said the Linfield manager's ban had been "upheld" but due to "mitigating factors" had been altered to a "two-match suspension". The sanction will now start on 11 April with the other two-match ban suspended for six months. The ban was imposed after Healy's red carding at Portadown on 12 February. Healy was furious after referee Arnold Hunter awarded the Ports a controversial penalty which helped clinch a 2-1 win. Linfield go into Saturday's Seaview contest five points behind the leaders and current champions in the first round of fixtures since the Premiership split.